Finals Outlook: Arguably the most decorated player who has ever played the ATP Finals, Federer has won the title a record six times, virtually always making it out of the pesky round robin stage (11 of 12). Indoors, quick courts, big event and he’s playing well – Roger’s won 14 of his last 15 – all suggest another deep run for the Swiss. This year, though, Federer won’t have any easy matches in Group B. Raonic just beat him. Nishikori is an in-form rising star and then there’s the resurgent Murray. That said, Raonic and Nishikori are making their debuts so I have to favor Federer’s experience, and I’d be surprised if he lost either. Murray’s been the hotter player of late, so a loss to the Scot wouldn’t come as a shock. In the bigger picture, I don’t see Roger beating Novak here. So if he can somehow avoid running into the Serb on the weekend (esp on Saturday) then I think a seventh title will follow. Otherwise, he’ll be the betting favorite to win every time he steps on the court. And don’t forget, he’s got an even bigger Davis Cup tie the week after. 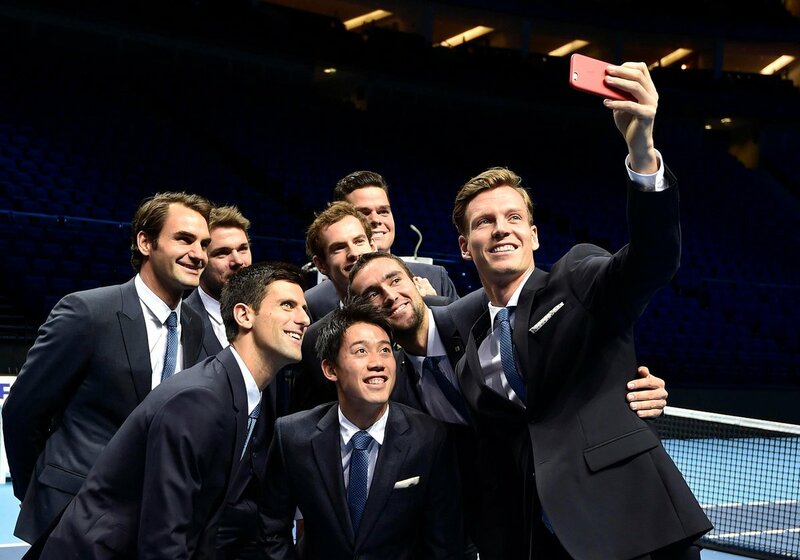 Who’ll win the 2014 ATP Finals? Roger Federer?? ?…never heard of him. Ahhh…well than explains it then. Look…if Roger’s in the right place mentally and he serves well, I like him…even against Novak. This is one of the places he dominates and it would generate some awesome Karma going into the Davis Cup final. I’d like to see him pull it off. All this being said, I see Murray as the “dark horse” if there is such a thing in an 8 man field. He’s playing better than pretty much everyone else right now. He knows how to beat Novak and he’s beaten Roger his share of times at non-slam events. I have noticed that little word “if” is the most used word on TX……”If” I had time I would count every time it’s used……just for grins! LOL. Don’t have time, unfortunately……..
Roger will escape his group. I don’t know why he should be fearful of Novak, he dominated him in their last match and is 3-2 on the year. Post 2008??? The only person Federer has ever needed to avoid is Nadal. He’s beaten Djokovic a ton of times in big and small matches. Same for Murray and pretty much everyone else. I agree with TV. I think this time around Djokovic might want to avoid Federer. Especially nowadays when Federer really relishes beating Djokovic. 17 grand slams. 6 WTF. Longest reign at #1. Obviously a master of avoidance. You guys! I for one believe that Roger will win this year and he will beat Novak should they meet. LOL, cannot help myself from these cheap laughters. I’ll stop now. It completely and utterly depends on the speed of the court I feel. Should they be quick: then he’s atleast a co-favurite with Novak I think, and i’d give him the edge even since at his best he probably is still the best fast court talent on the tour I feel. Should the courts be slow (as in recent years): Then I think Novak quite clearly is ahead of him. And depending on how he plays maybe even Andy Murray might fancy his chances against Fed. The court speed in all those events is reasonably quicker than most other places on tour. Cincinnati, Dubai and Shanghai may just be the 3 quickest Outdoor HC events on tour and Basel being Indoor and Halle being Grass are hardly on the slow side either. They are still quicker than most places on tour. His best chances lie on the quicker courts since whilst he can compete on the slower ones his chances of success will decrease in comparison to that he had in his 20’s. IF the courts are quick I’ll say Fed is the favourite. Winning Dubai, Basel, Halle, Cincy and Shanghai this year suggests his fast court game is booming and well. IF they are slow *as I suspect they will be judging on recent year WTF courts) then he’s atleast behind Nole for me and possibly Andy even if Muzza clicks. He can win regardless of the speed of the court: but quite obviously- like anyone- his chances are affected by the environment in which he plays. this is a nice picture of the final 8! It took three sets for Novak to beat Roger at the WTF last year. I believe Roger, with the crowd behind him plus his renewed confidence, will carry him to the title whether his road goes through Novak or not. Brando, good points. Tend to agree. Either one you think will win, I’d love to see a Fed/ Novak match, I still think they are one of the most entertaining match ups in tennis. ^ yes, it almost always produces tight matches with tense competition and great shot-making. they often bring their best for each other. elina, i think nole beat fed in 2 sets the previous year. still, it’s true fed’s changed his racquet and added more forward momentum to his game, which could be an important factor, should he and nole meet. Jane, Nole won in 3 last year in RR,but in 2012 in the final he won in two.Let hope Nole will do well this year too. All the best to You too. This post has no legitimacy since Skeeze wasn’t the first one to respond. Did he bless this? IMO Roger will make the final and lose to Novak in probably two or three tight sets…. Just because Humble gets beat once in a blue moon posting first on a thread doesn’t mean the end of the world. Everyone knows Humble posts first most of the time. At least skeezer doesnt pretend to be federer…no? SG1 i was only teasing with the Humble Skeezer comment…. Contrary to popular belief, I do like 2 of Skeeze’s 3 cats. What is there to say about this legend who has attained the pinnacle of glory in Tennis and who is a living example and inspiration for the younger generation. It amazes me as to how this man still manages to attain motivation and set future goals when he has achieved all that a player could aspire and yearn for. He is the centre of excellence and role model for the sport. As tennis fans, it is our best fortune that three of the very best the sport has known are playing simultaneously. As regards his chances at WTF, well as Brando rightly explained, the quicker is better for Roger. Iam not sure how the surface would play out and so I reserve my comments. Brando – great post as usual. You are apt to become a tennis columnist. Skeezer, honestly what is funny there ? I fail to decipher. If you could throw some light on the intricacies of what you actually mean, it would be useful and we can too share the humour behind the comment. Michael put it this way not so great when insulting people personally,as for been a tennis columist that honour should go to you ;))…. Thanks !! Still not sure whether I deserve that honour ? But you have always been effusive when it comes to conferring compliments and that is a luxury not many can afford for it requires a clean and big heart. Michael you certainly do,i love your posts,just love them :))…. Thanks once again !! It always feels great to interact with you. I too love our exchanges. How about it Tennis-X staff,why not let Michael write a thread for posters to blog on,like the time you let Ben Pronin?…. At least he doesn’t hide behind fake platitudes, humilities and injuries. Really. What is going on? Brando, you are becoming tiresome with your snidey digs at fed and skeezer. You need a break and some time out to reflect on a lacklustre year. How about it Tennis-X staff,why not let Michael have a thread for posters to blog on like you did with Ben Pronin one time? Excuse the double post,as the first one didnt come up,dont know why?…. Hippy, sure. If Michael would like to he certainly can. He can email us at contact at tennis-x.com. Come On Michael,how about it?…. Alison, thanks once again for yr nice gesture. I will certainly go positively forward by taking yr proposal and I thank Sean too for endorsing it. Just give me some time. the court speed??.. what the ****!!! the ball just stays up to be hit with plenty time to get around it.. purposefully changed? ?